We planted several Gypsy Pepper Plants in our garden this year and we have a bumper crop. I learned that they are thin skinned and can be harvested from the time they turn lime green and right up to the time they turn dark red. They are not hot and as they turn colour they continue to sweeten. They have great flavour and stand up well in stir fries and are perfect for stuffing since they have a thinner skin that doesn't turn mushy when cooked. If you don't have any gypsy peppers around, go ahead and stuff bell peppers, either way, it is a healthy meal. If you would prefer a less nutty texture, use plain rice instead of wild rice blend. Spray 2 8X10 foil pans with cooking spray or a large rectangular casserole. Cook rice with water according to package instructions but drain the rice 10 before the end of cooking time so that it is slightly undercooked. In a large skillet, heat oil and add ground turkey and onion, garlic and broccoli slaw and fry scramble using an egg flipper until the turkey is no longer pink. Add the poultry seasoning, red pepper flakes, salt, rice and undrained tomatoes. Stir to combine. Add the feta cheese and stir gently. Spoon into pepper halves, mounding the filling and place in pan. Sprinkle with cheese and cover with foil and bake for 30 minutes at 350 F. Remove foil and continue to bake for 30 - 45 minutes. Could this filling be frozen and used at a later date? Single girl...cooking for one! I don't see why not. The filling is cooked so even if you use frozen ground turkey to start it would be okay. Jennifer Do you mean to freeze after entirely assembled & cooked?? Wouldn't peppers be mushey in that case ? I have been making a very similar dish all summer. 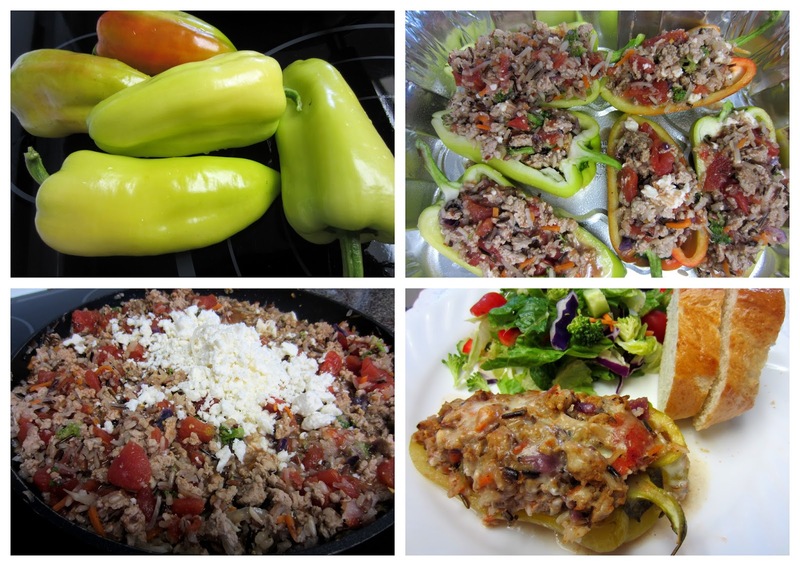 The recipe that I use, uses ground beef and seasonings that give it a Mexican taste. I got the recipe from a Weber cookbook. I have been making mine on the grill - indirect heat for about 30 minutes. So yummy! These look wonderful Lovella! I love using ground turkey and this sounds like a great way to make it. Thanks for the recipe! Thanks for finally giving a name to the peppers that mysteriously appeared in our garden this year. I bought bell pepper seeds at the store from a name-brand company, but about 2/3 of them came up like these! I had no idea what kind they were. They are great raw. I use strips as a dipping vegetable with hummus and it tastes wonderful. They also did well in my pickling recipe, and as you say, they are good in stir fries and for sausage & peppers. I posted two questions earlier, but they have not appeared nor is there any further mention that they are being considered. Maybe I can get an answer this way! You mention "giving a name to the peppers" - but I've never heard of gypsy peppers, would like to know if there is a similar pepper by a different name? Also, does the oven need to be hot-hot (over 375 degrees) or low heat (325 or lower)? Audrey, I'm sorry there has been a bit of a cunfusion with the question being on our contacts page, where I finally responded today and then noticed your question here ... so I'll copy the response here The gypsy pepper is a smaller sweet pepper. It is not hot, can be enjoyed raw and holds its shape well when cooked. It is rather like a Romanian sweet pepper if that helps at all but you could replace with any sweet bell pepper. Bake stuffed peppers at 350F. my great grandfather grew gypsy peppers and they are my absolute favorites! my great uncle still gardens and plants them every year, saving seed that has been passed down from his dad. all of the ways mentioned above are good uses for them. one of my faves was when my great grandma would make pickled peppers with them. you have a keeper there, with that pepper. I haven't grown these in a while in my garden but I remember that they did pretty good. I have just forgotten to grow them again. Your stuffed peppers look great and I bet they are with the thinner skinned peppers. Thanks, Anneliese - for giving me the oven temp as well as a description of the pepper. I think it's what we called a banana pepper in Florida, but I haven't seen them here in VA. They probably have a different name here (not banana or Gypsy). I enjoy your web site!